Setting up a bakery can seem daunting. Even if you want to mess around at home after taking one of our wonderful bread courses can seem daunting. All that stuff! It may seem like rather a lot to spend, especially if you don't know whether you are going to take to it. Ladies and gentlemen - just for you - three of the BEST BAKERY HACKS EVER! 1. Showerhats. Seriously. 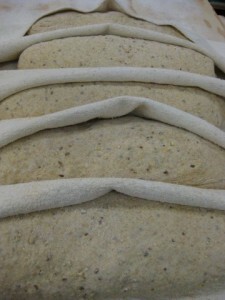 They are brilliant as covers to let the dough rise either in the bowl or in the tin/basket. They are elasticated, they are reasonably air tight. Don't spend a fortune. Buy them in bulk on amazon or start taking them from hotel bathrooms. That's three different kinds of sourdough rising, by the way. 2. Cheap baskets. I kid you not. Bannetons are really rather pricey. Instead of forking out for them, you can go to Chinatown (wherever you live) and get cheap baskets for a fraction of the cost. They even come in either reed or plastic! Or you can go to a catering supply company and get bread baskets (the kind restaurants serve bread in). Either way they are much cheaper than bannetons. They work for all but the stickiest dough. 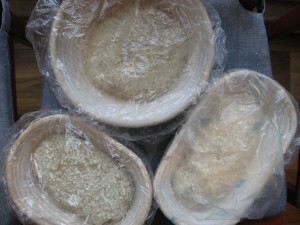 Dust well with flour, rice flour, or corn flour to make them more stick resistant. You are looking at amazing coriander bread, for your information. Baskets from a market in chinatown. A fraction of the price of bannetons. 3. The couche. This is a fancy name for a piece of cloth on which you proof things like baguettes and ciabatta. You do not need to go to france to buy it. You can nip along to a fabric store and buy poplin. This is what dressmakers use to make patters and sew practice garments before they cut up the really expensive fabric. Get nice thick cotton or linen. It's super cheap. Don't those whole meal baguettes look great? Poplin sourced from a fabric store - way cheaper than a cloche. There you go! Three fantastic Bakery Hacks to make your life easier and cheaper and to enable you to still turn out wonderful, hand made bread. Intrigued and want to learn more? 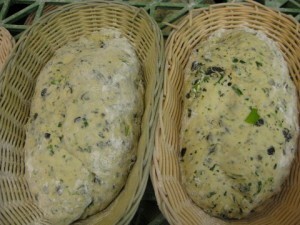 Come and take a bread class with us. Hacks, tips, tricks and all manner of common sense and demystifying will make you love baking bread. I need your help please. I purchased a voucher for my son and it looks like the receipt from Paypal went into my spam box, as I didn't get conformation of payment and my laptop was on the blink I thought I had not purchased this so left it a few days and re ordered the voucher again today. Having accidently viewed my spam box it looks like I did order this on the 4th. So I have accidently booked 2 vouchers. is there any way I can be refunded for 1 of these? I am not sure if you have a different e mail box for this sort of thing so I saw this and thought you could help. need 200 MT of white flour # 0 . 50 kg in Bag price CIF port of Dubai .